Behringer has introduced the new HCS 150/160 MF saw, a high-performance carbide circular cold saw that uses multi-fluid cooling technology to prevent heat transfer to product during mass cutting applications. Unlike misting systems, the HCS 150/160 MF saw's innovative flood coolant system facilitates increased throughput by enabling rapid cutting over longer periods of time with fewer interruptions due to heat build-up. A vortex air blowing system further enhances cutting temperature control to help maintain consistent production rates. The Vortex system is also particularly valuable to customers who have cutting applications that require the material to stay free of liquid. "The continuous cooling nature of the multi-fluid flood system permits a greater level of unattended operation because operators don't need to worry about heat build-up. Fast, uninterrupted cutting improves throughput and the worker saves valuable time which can be devoted to other priorities," said Richard Klipp, Behringer president. Klipp also said that flood cooling simplifies setup since a source of compressed air is not required. The new saw is ideal for cutting high-alloyed heat resistant steels. Configured for workpiece diameters of up to 160 mm, the HCS 150/160 MF features a wide speed range of 20 to 250 rpm to accommodate most wet or dry sawing applications. The robust, rigid design of the HCS 150/160 frame enhances vibration dampening and a new blade guide features Behringer's blade vibration absorber design. 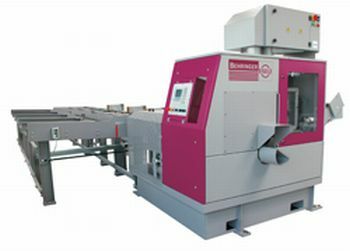 This feature, coupled with an active chip cleaning system, improves saw blade lifetime.